Hospitals and doctors are utilizing video games to help children with debilitating pain and life-threatening illnesses understand and cope with their conditions. HopeLab, a health and technology nonprofit, uses games to help cancer patients make sense of their disease and manage their treatment. Through a grant from the Entertainment Software Association Foundation (ESAF), HopeLab developed Re-Mission 2, a series of six free-to-play online games designed to boost patients' morale, educate them about their disease, and encourage them to adhere to their treatment regimens. 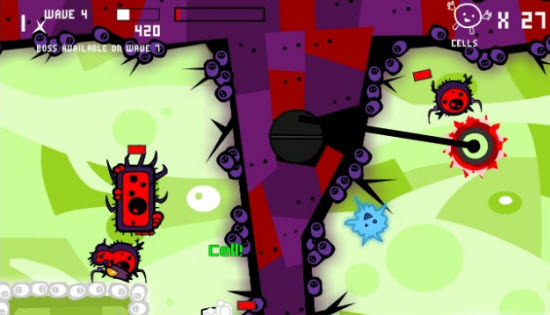 In one game, players zap individual cancer cells and toxins using "weapons" such as chemotherapy and antibiotics. In another, players lead a colony of leukocytes to attack cancer and bacteria while exploring the human body and learning how different treatments affect different types of cancer. "When you see on the screen and visualize what's happening inside your body and what the chemotherapy is doing, you're not looking at a PowerPoint, you're not being bored to death by your doctors," said Jose Hevara, one patient who plays Re-Mission 2. "You're playing a game, and you're being chemo, and you're killing your bad cells. And I feel like that's something a kid could relate to at any age." Video games and game technologies also help to manage children's chronic pain. Doctors at Children's National Medical Center's Pain Medicine Care Complex in Washington, DC, for example, use the Microsoft Kinect's motion sensing system and biometric scanners to monitor patients' pain in 3D. The controller enables doctors to monitor the angle, distance, speed, frequency, range, and depth of patients' motions to empirically measure their states and intensities of pain. The new method replaces more traditional and less precise approaches, which rely on patients' subjective reports and doctors' observations. In addition, the center's patients play active games during their therapy sessions, which improves their bodies' range of motion and helps distract them from the aches and pains they feel throughout the day. Children's National Medical Center and HopeLab are just two organizations that are advancing video games to personalize treatment and improve health care. These innovative solutions are paving the way for a future in which medical therapy could be as close as a console or Web browser.